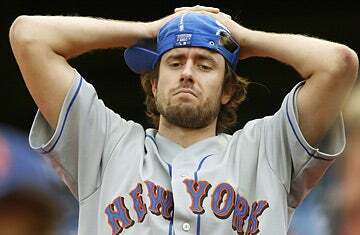 Oh, Mets fans! It feels like the whole world is out to get you, but honestly, you're kinda asking for it. When one of you goes diving into a baseball stadium toilet after a gold tooth and gets stuck ... we're all a little embarrassed for you. Stadium security had to call in a plumber to rescue a woman whose arm had become stuck in a toilet at Cit Field last week. How did that happen? She somehow dropped a gold tooth into the water and just had to get it back. Big mistake. Her arm became lodged as the ultra-low-flow toilet repeatedly and loudly flushed over her. The woman did not recover her tooth, but was plenty relieved just to leave the bathroom. The Mets and Cardoza Plumbing declined to comment. Some low-flow toilets use powerful vacuum suction to minimize the amount of water needed, but it's unlikely that contributed to the woman's hand being stuck, a Queens plumber said. "The truth is, this kind of thing happens all the time — usually with wedding rings or cellphones," he said. "People have probably been getting their hands stuck in toilets as long as there have been toilets." Indeed. Now, I'm sure the Citi Field toilets are quite luxurious when compared to the dungeons of Shea, but the place ain't exactly the Seibu Dome. Maybe let it go next time, okay?